As promised, here's my recap from last night's Chicago Diner vegan feast. Let's just say this, if you're vegetarian or vegan and in or around Chicago, this is a must (even more so if you're not from some place that has lots of veggie friendly restaurants). I had printed off the menu last week to study. I knew I would be a little overwhelmed with so many options. One of each please! We started with their spicy Buffalo style "wings" made from seitan and served with a vegan ranch dressing. I was really leaning towards their Radical Reuben (Corned beef seitan, onions, peppers, sauerkraut, vegan Thousand Island & cheeze, on marbled rye). When Jason heard it was award-winning, he called dibs. No worries, I went with my second choice, the Dagwood (Seitan roast & corned “beef”, “bacon” & cheeze, with lettuce, tomato, onion, pepperoncini & spicy sauce on a hoagie). My other choice was their Sweet Potato Quesadilla (Spinach tortilla, marinated seitan, fat free black beans, mashed sweet potatoes, cheeze, spinach, salsa). It was such a tough call for me. But I went with the sandwich as I do make a similar quesadilla as Jason reminded me. We were both really happy with our selections. It wasn't just barely flavored seitan with some lettuce and tomatoes thrown on some bread. The hoaggie was whole grain (think Ezekial bread full of nuts and seeds). Everything was full of flavor. It was really hard to leave anything on the plate. I wanted to eat and savor every single bite. 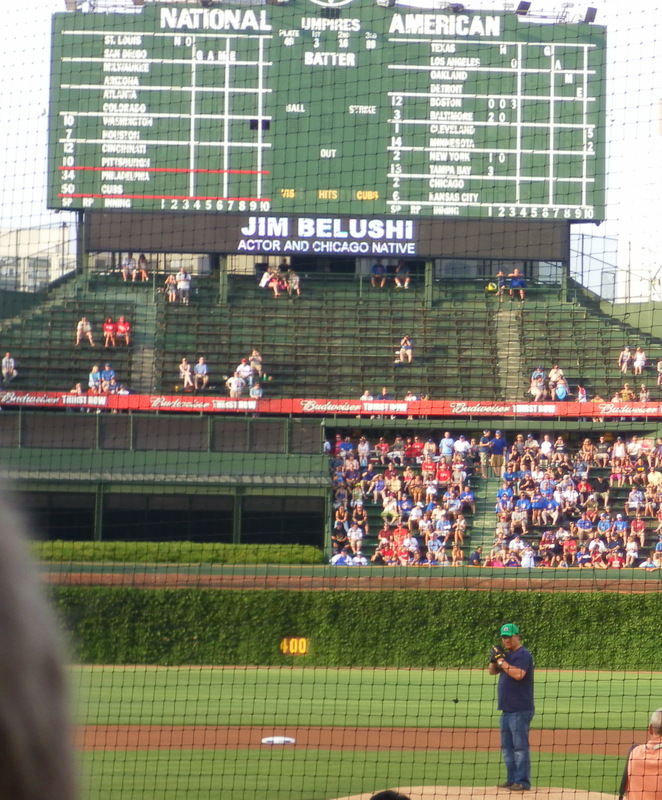 After stuffing ourselves silly, we walked over to Wrigley Field. I was happy to be walking after eating ;-) It was a hot, humid evening. It seemed to be really breezy, until we got to our seats. While we had some freaking awesome seats behind home plate, the wind wasn't cooperating in that area. Of course, when you have thousands of people packed in close, I guess the wind doesn't have much of a chance huh? 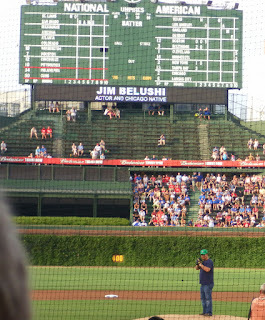 Jim Belushi threw a pitch and also led the 7th inning stretch. Even better, the Cubs won. Apparently they weren't really expected to win. Now, I like baseball, but don't really follow it. I just enjoy going to watch our minor league team. So, I know how the game works, I enjoy being outside, but I don't know who's who or what's what. I know Jason wanted the obligatory stadium hot dog, but we were simply too stuffed. So no stadium eats and only one (half for me really) drink. I was almost too full to even think about drinking water. I will admit to getting rather cranky and ready to be done around the 7th inning. I was so sweaty, sticky, slimy feeling and just getting tired. I knew it was going to take about 30 minutes or so to get back to the hotel as well. Then there was that massive crowd that I knew would be heading towards the Red Line right along with us. Ugh. That part was the worst - being crammed into the terminal trying to get through the gates then onto the train. We were smashed into the door basically with no handle and some drunk chicks that were squealing so loud you couldn't even hear what stops we were hitting. I think everyone was relieved when they got off. So, yes, I got cranky and got to that, "I'm freaking done" point. But that doesn't mean it was a horrible evening. 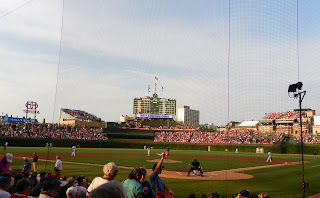 I got to enjoy vegan dining and to experience my first major league baseball game. There's something said for being in a stadium like Wrigley Field. The history and nostalgia is impossible to explain (or replicate in new stadiums). It reminded me of the stadium we used to have called Ray Winder Field. It was one of the oldest in the country, but a new, fancier, bigger stadium was built and Ray Winder sits empty. So many memories of going with my father and sister. So I can only imagine all the memories created at Wrigley for so many people. Kind of awesome.